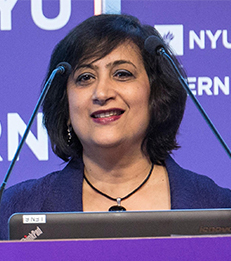 Geeta Menon is the 11th Dean of the Undergraduate College at NYU's Leonard N. Stern School of Business, starting in her role in July 2011. She is also the Abraham Krasnoff Professor of Global Business and Professor of Marketing. She has been a member of NYU Stern’s Marketing faculty since 1990 and served as Department Chair for almost five years (Jan 2004-Sept 2008). In 2015, Dean Menon was named one of the 20 most influential global Indian women in business and the arts by The Economic Times. As a scholar, Dean Menon is known for her study of consumer psychology, context effects in decision making, survey methodology, health risk perception, and emotions. Her work has been published in leading journals such as the Journal of Consumer Research, Journal of Marketing Research, and Organizational Behavior and Human Decision Processes, and has been funded by the National Institutes of Health and the American Diabetes Association. Dean Menon has held several leadership roles in the marketing research and consumer behavior community. She was elected President of the Association for Consumer Research (ACR) in 2010, served on the ACR Board of Directors for four years, and was co-chair of the 2004 annual ACR conference. She served as Associate Editor of premier marketing journals such as Journal of Consumer Research and Journal of Marketing Research. In addition, she has served on the editorial boards of these journals as well as the Journal of Consumer Psychology and the Journal of Public Policy and Marketing for several years. She is currently serving a second term on the Policy Board of the Journal of Consumer Research. As an educator, Dean Menon has taught core and elective marketing classes in the MBA (full-time, part-time and executive) and undergraduate programs. She particularly enjoys doctoral education, having mentored several PhD students who have gone on to established careers at other premier educational institutions. She is the recipient of the Citibank Award for excellence in teaching at NYU Stern. As dean, she has propelled the NYU Stern Undergraduate College upward to its current stature of top-ranked in the world. Applications have increased by 75% during her tenure, the selectivity is at single-digits for the first time ever, and the admissions yield rate has increased to record levels. She has advanced the undergraduate curriculum with innovations like the Stern Program for Undergraduate Research (SPUR) engaging over 100 faculty and 500 undergraduate students to collaborate on research. She oversaw the creation of the NYU Stern undergraduate Office of Student Engagement (OSE), and the College now enjoys 98% summer internships in the junior year, a strong 98% placement rate within six months of graduation, and one of the highest entry-level salaries among undergraduate business programs. Relying on her background, she has prioritized brand building and promoting student pride, and this is reflected in student satisfaction surveys over the last seven years, and the popularity of the #IAmStern/#WeAreStern campaign on social media. Dean Menon, who reports directly to the President of NYU, is a member of NYU’s Senior Leadership Team, and has served on several university committees addressing issues of affordability, judiciary and curriculum. Prior to her deanship, Dean Menon held appointments at leading business institutions, including the Wharton School at the University of Pennsylvania where she was the Laura and John J. Pomerantz Professor of Marketing (2008-2010), the Indian School of Business where she was a Visiting Professor (2009, 2011), Stanford University (Fall 2000) and the Indian Institute of Management-Bangalore (Spring 2000) where she was a Visiting Scholar. She earned her Ph.D. in Business Administration from the University of Illinois at Urbana-Champaign in 1991.